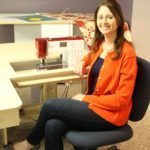 Can she really write a whole blog about potato salad, and what is so special about german potato salad and what is it you may ask? Well, let’s talk about this beloved special side dish. In our family, that is the Clem and Mathilda(Tillie) Kuennen family I have been eating this at our get-togethers as long as I can remember. You know how it goes, Aunt Donna brings the home-made sausage, Aunt Lori brings the corn and Aunt Geneva brings the german potato salad. Well what happens when these aunts and uncles grow old, become ill or sometimes pass away, someone needs to carry on the tradition and continue to bring these dishes. It’s like passing on our family traditions, just through food. 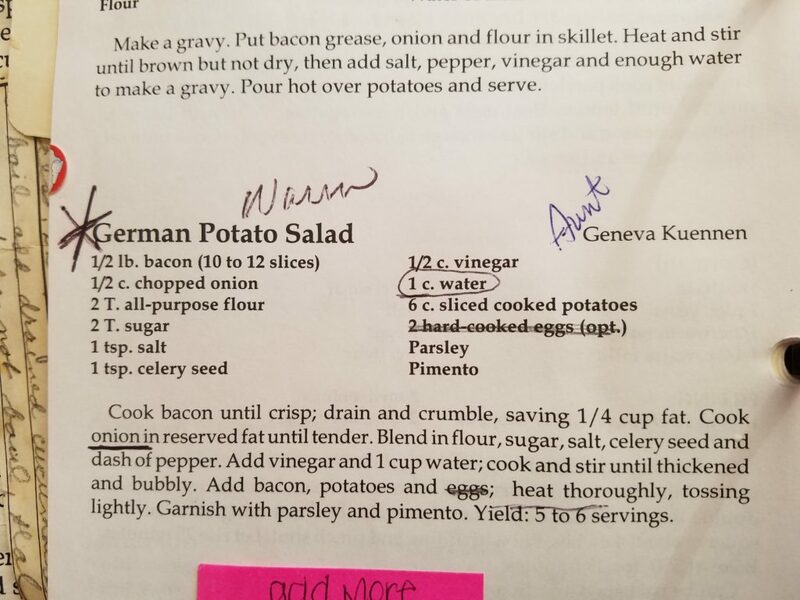 At our gathering last summer in St. Lucas, two of us cousins brought the german potato salad, both are very good and I think we both knew the importance of passing down these recipes in the Kuennen family. So let me tell you more about the recipe. This “salad” is served warm and it has a sweet and sour taste to it, I feel like it’s one of those foods if you grew up with it you love it, and if you were brought into the family you love it or you don’t. As you can see there is an interesting list of ingredients, you can add others or omit some of these, I do not add the eggs, parsley or pimento. 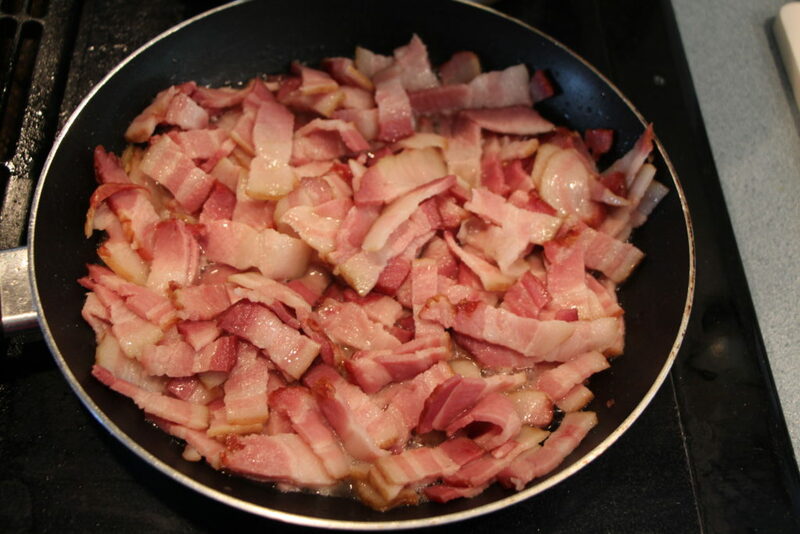 Also I don’t really measure, I just cook up a pan of potatoes, fry a pound of bacon( yes, lots of bacon is good!) and the rest is by taste and consistency. 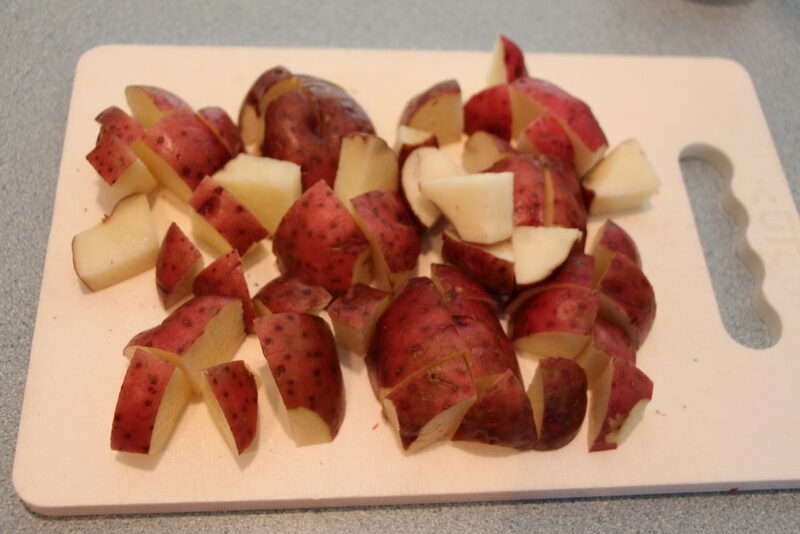 First I boil the potatoes cutting them all about the same size.. Red skinned potatoes add color to the salad and hold their shape, be sure to undercook them a bit, or you will have mashed potato german salad. While the potatoes are cooking, I cut up the bacon and fry it until it is fairly crisp, this helps to render off some of the fat but I don’t fry it to the point where it is crunchy. I Chop the onions, set out a heavy pot and my other ingredients and by this time the potatoes are done cooking, give them a quick drain and leave them set, lid off(so they don’t continue to cook). The bacon will be done, so place this on some paper towels and add some of the fat to the heavy pot, add the onions and fry until soft. 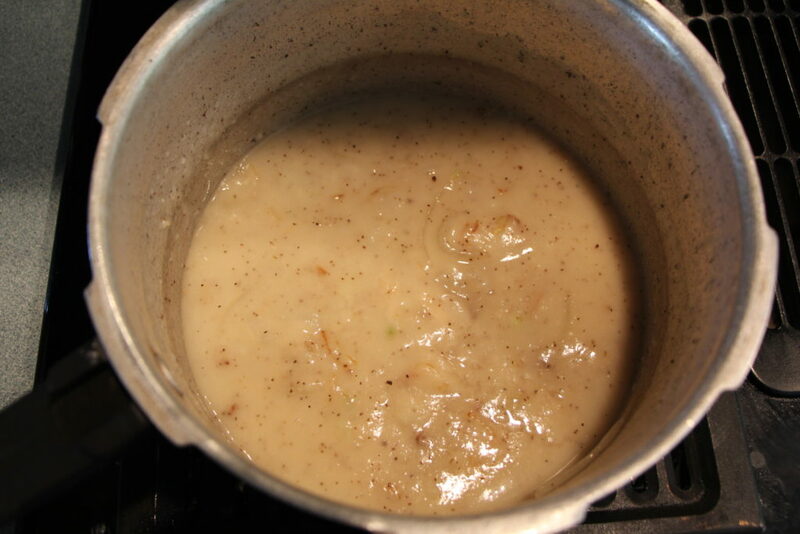 The next step is like making a roux, or a thickening sauce. I whisk the flour into the fat and then quickly add the water and vinegar, because if you are to slow you know what happens, lumps and we don’t want that. Next add in your seasonings and sugar and taste, is it too sour, add sugar and cook until it’s fairly thick. Also is it too thin then add more flour, or is it too thick, then add water. The photo above is what mine looks like. 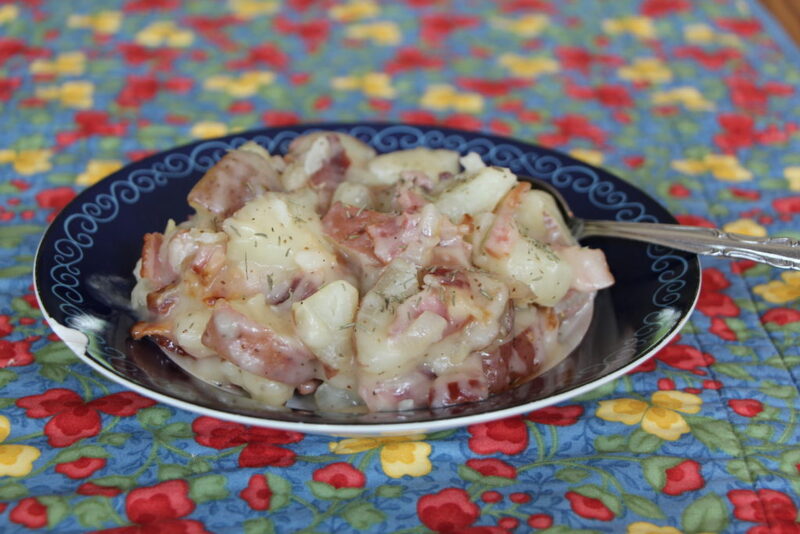 This next part is the best, you mix the sauce, potatoes and bacon together, I usually use the large pot I cooked the potatoes in to mix this all together. You can check the taste again at this point and see if it needs anything else. Here is the finished salad! This can easily be made the day before and just warmed up, I do this often, it also works well to bring to an event in a crock pot. I am sure your family has favorite food traditions as well, share them with me and my readers. Have a Great Day! This entry was posted in Uncategorized on May 31, 2017 by Carla. I like German Potato Salad but sadly Roger doesn’t so I don’t make it. I sure do grab it if I see it at a pot luck though.